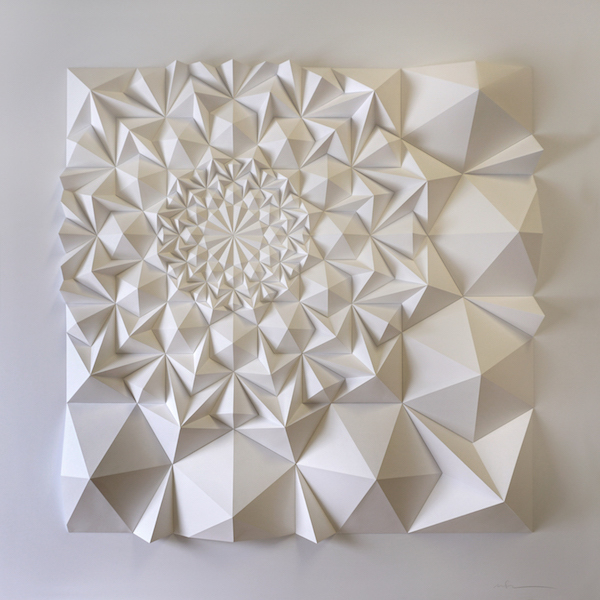 From his early experiments with folded book art, Matthew Shlian has sprung exuberantly in many directions. Kirigami—the art of cutting, folding, and gluing paper—is the medium he’s chosen to explore the paradox of how a two-dimensional material can create three-dimensionality. Paper has special properties that enhance experimentation because it can collapse, expand, and return to its starting point as if it has memory. Sometimes Shlian designs on the computer, using 3-D modeling programs, and he often finds use for flatbed plotter cutters, but he always folds, glues and assembles by hand. As he’s said in many interviews: “If you can hold something in your hand, you can understand it.” For his graduate thesis at Cranbrook, he built Misfold, a thirteen-foot, folded paper kinetic sculpture that, with the help of a robot, slowly and rhythmically rises vertically, stretching up like an unfolding paper lantern. As a paper engineer, Shlian has designed storefront art for Levi’s and murals for Facebook. He’s partnered with Ghostly International, a gallery and store that combines music, technology, design, and visuals into one online platform. At C.S. Mott Children’s Hospital in Ann Arbor he constructed Unlean Against Our Hearts, a Tyvek half-torus shape which he calls “a paper slinky,” the circles of its two ends resting on perpetually rotating plexiglass turntables. At the University of Michigan, he collaborated with molecular scientists who study cellular membranes and with a team of engineers who are working to create more flexible solar cells. He’s given a Ted Talk and appeared on Sesame Street when the word for the day was “sculpture.” Last year he got an email from a girl who was getting a custom-built prosthetic leg from Bespoke Innovation. She asked if he could design something that would decorate the fitting that covers her peg and he sent on a tessellated design that fits around the prosthetic shin like a silver cuff. 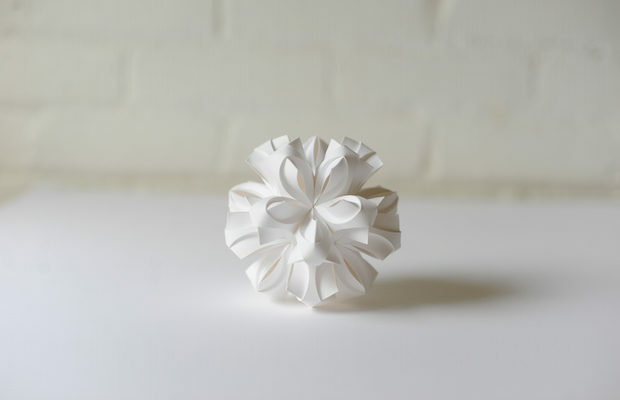 For the most part, his sculptural works are constructed from white or black archival paper and they sometimes exist as free forms like Eight Emperors Bloom, his crisp, contemporary variant of a paper flower, which you can hold in your hands, or can been viewed hanging inches off a wall in pleated relief form. You can see the influence of Islamic design in his complex geometric folds: conglomerates of diamonds, triangles, or even curved shapes which can amass into starbursts. More recently, he’s experimented with what look like waves, slopes, and draping shapes, exploring the capabilities and limitations for stretching and rotating his material, always motivated by the desire to find out what the work of his hands will look like in the end. Last January, he had a solo show at Florida Gulf Coast University, in Fort Myers, Florida that included a long, horizontal piece, Ara 117 (36 by 72 by 2 inches), which appears like the paper translation of a white-on-white quilt with a pinwheel center, light and shadow playing on the faceted geometric pieces. 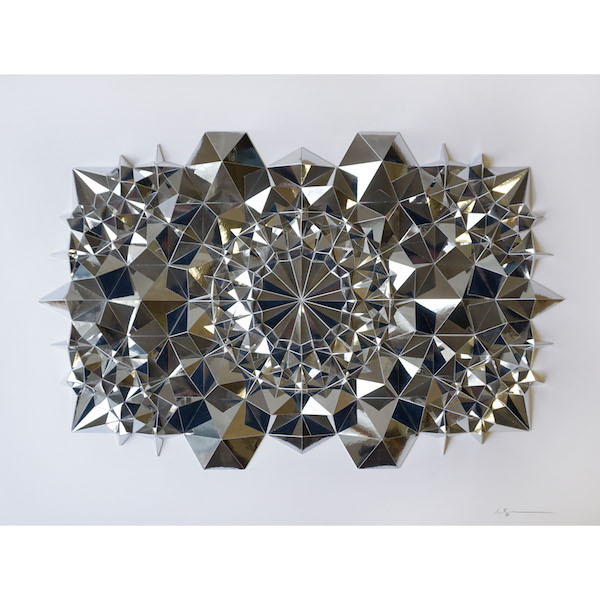 Because Shlian’s curiosity has taken him farther afield, as he puts it, “into the cracks between art and other disciplines,” the work is also about perception—how the eyes see structural organization in patterns even when there are deviations and irregularities. If you let your glance roam across the surface, you’ll see unexpected asymmetries everywhere. Shlian is interested the way mistakes can lead in all directions and in the way the brain anticipates repetitions and understands mirroring. In a variant constructed from silver foil but similarly designed around a wheel-like center, he continues to probe the basic functions of light, form, shadow, and curves while the creases and folds look like the craftsmanship of a diamond cutter. One of the finest pieces in the show, Ara 211, stretches into the form of two open fans, one facing up and one facing down, with intricate pleats, stars, cross shapes, and fans within the fans. The work is virtuosic, standing as an homage to the long tradition of paper folding in our material culture, and at the same time it vaults ahead, into the vanguard where science, technology, and the arts combine.